Now available in packets like regular sugar. Great for keeping in the car or purse. Instead of corn syrup filled soda pop, order unsweetned ice tea and add "Just like sugar" for a healthy delicious drink. a 12-ounce can of soda can have as much as 13 teaspoons of sugar. Bag contains 100 paper packets of just like sugar sweetner. Use same amount as you would normally add of sugar packets. 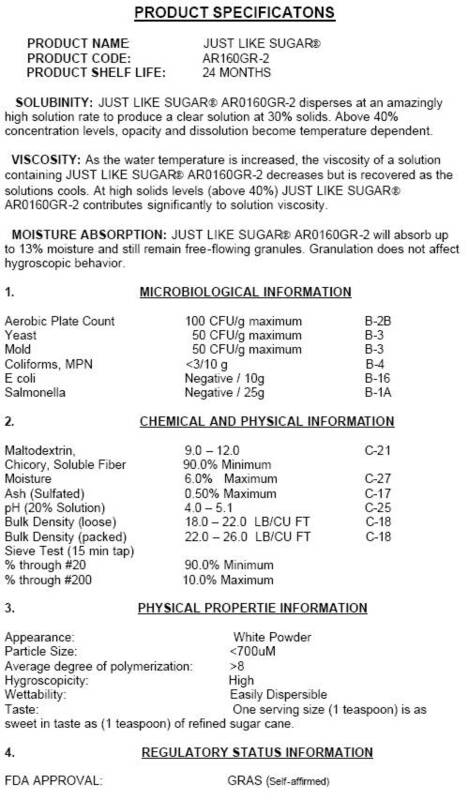 Just Like Sugar® is also available in a 165g bottle, in bulk 1, 5 and 50 pound bags. Note: One teaspoon of Just Like Sugar® has the same sweetening power as one packet of regular cane sugar. This version is a finer powder for use in baking. Ingredients are FDA "Generally Recognized As Safe" (GRAS) approved Contains no artificial sweeteners, such as aspartame.